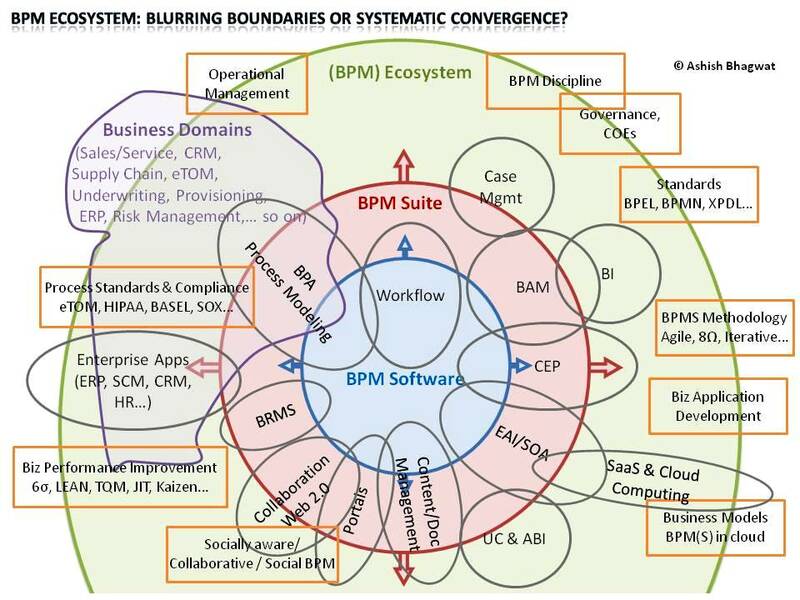 BPM Ecosystem – Blurring Boundaries or Systematic Convergence? The list goes on. In the initial years of BPM, we thought we had few problems that would slowly disappear with maturity in the discipline / technology. Come 2010, and we are dealing with more variants and more convergence areas. Depending on where you look from and where your stakes lie, this could be a case of blurring boundaries or of significant convergence in BPM ecosystem. So, we have various paradigms all blurring the boundaries. The circles of BPMS (as Software and as Suite) are expanding (as depicted by outgoing arrowheads) to include more and more of what we need to make BPM work in real life systems and processes. On the other hand we have the business domains and disciplined pushing to align the technological progress with the needs of business. Pictures should speak a thousand words, but in this case I find it still difficult to say all I wanted to through just one graphic. Well, I got limited by the space and dimensions in a similar way as our process models’ inability to satisfy all stakeholders views and needs! Well, I could not somehow significantly illustrate one big gap that divides the BPM fraternity – and that is between business paradigm and technology paradigm – difficult to understand the conflict actually, since all mutually need each other! Anyway, what looks like a “blurring of boundaries” otherwise, to me is “a systematic and very methodical convergence” of complementary disciplines and technologies around BPM. I see it in the picture above, do you? And can we all “converge” and leverage on our best opportunity in recent times to really take BPM to where it belongs? This entry was posted on March 16, 2010, 4:23 pm and is filed under Architecture, BPM, Business, Cloud Computing, Leadership, Management, Technology. You can follow any responses to this entry through RSS 2.0. You can leave a response, or trackback from your own site. This is so true, what appear to be opposing forces and industries at work are actually disciplines and technologies within a shade of each other. Which begs the question; who is the closest to this utopian view ?…. Theo, this question is difficult to answer. This is not going to be achieved by a vendor through only technological strenths, but the alignment with the discipline, business centricity and methodologies are of importance too. Need someone to come up and do this please…! Can i public this picture in my blog? I write about BPM but for spanish people. look at this… in my blog.